Before we start chatting about your savings you first need to sit down with your spouse and work together to create a customized budget for your family. 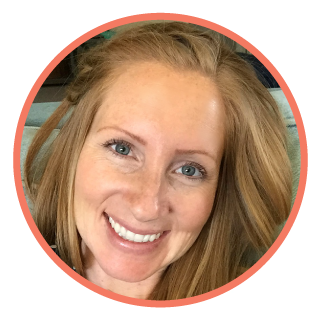 I created this FREE Financial Unity Workbook to help you do exactly that! Work together and create a financial plan that is going to get you both insanely motivated to work towards your financial goals! Once you have set your family budget and financial goals together, you then will be ready to start saving with a purpose. THAT is how you will stay motivated! If you are just getting started, like our family, then it’s probably best to stick with a basic savings account with a bank that you trust. This post contains affiliate links at no additional cost to you. Thank you for supporting Pennies Into Pearls by suing my links. Our family at the beginning of this year switched over from Wells Fargo Bank to Capital One 360. We have both the 360 Checking Account and currently have 10 Capital One 360 Savings Accounts. I love how easy it is to move money between accounts and the layout of the screen both on the computer and in the free app are super user friendly! What’s also amazing is that there are NO MINIMUM balance required and NO FEES AND you actually make a little money from interest! We get like $0.50 a month but that is amazing compared to the fees we were PAYING at our old bank! Once we build $10,000 in a long term savings account, we will switch it over to a Money Market Account so we can get a higher interest rate for return. You can find more information about the specific numbers that go into the basics of our family budget and savings goals here! Why More Than One Account? Keep your money organized! Instead of putting all your savings into on big pot, open individual savings accounts for each financial goal. 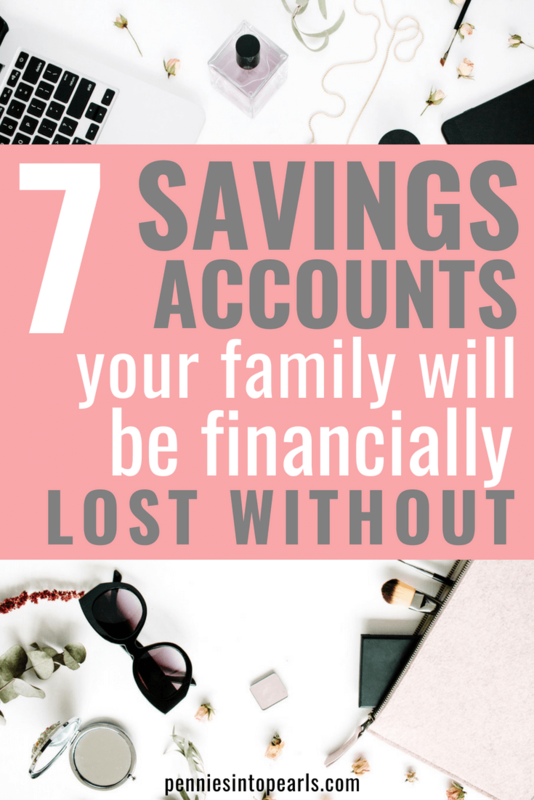 Not only will it help you stay financially organized, but it is a great way to stay motivated as you watch each savings account grow closer to it’s goal! Having separate savings accounts will also help you stay prepared avoid discouragement. If all your money is in one account, it will give you the false security when you see that big number sitting behind the dollar sign. Well, when that number actually needs to be divided between five different accounts, you in reality are not as close to your goal as you thought! These are the basic savings accounts for someone who might be trying to get out of debt or is just getting started with settling into a financially stable life. Once you get into a good flow with funding these savings accounts, you can use your Financial Unity Workbook as a guide to utilize additional savings accounts to work towards your dream goals! 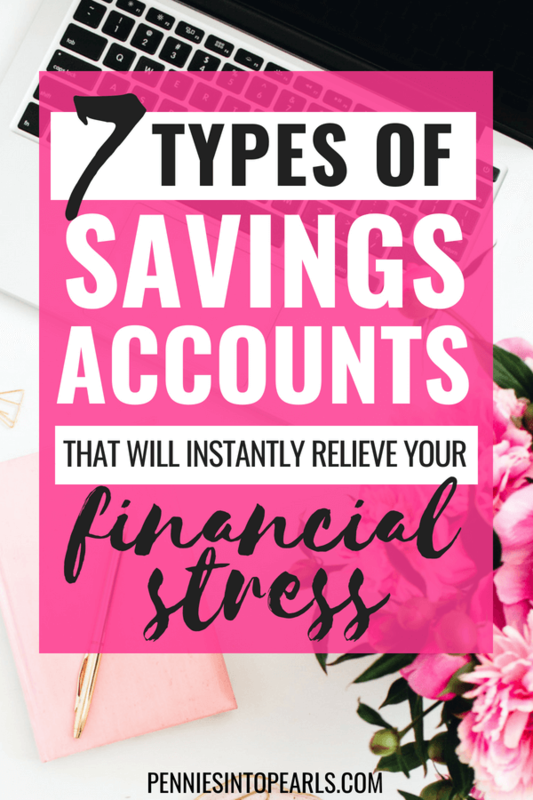 These savings accounts are to prepare you for the top financial stresses that Pearls find themselves running into on a regular basis. BUT once you have these savings accounts in place before your bad day comes, say goodbye to the stress! In addition to these 7 different savings accounts, we also have 11 cash envelope savings categories that we contribute with each paycheck. You can read more detail about those here. 1.Your top priority needs to be to build a $1,000 Emergency Fund. This money is to be strictly used in only emergency situations! The semi-annual Nordstrom sale is not considered an emergency! 2.Start by putting one month of mortgage or rent into your next savings account. Having the cash one month ahead of time is going to make sure that you are never late on you payment again! 3.Getting one month ahead of your bills will open so many more doors to free up your cash to do things like monthly grocery shopping and monthly cash envelopes. So slowly start putting enough cash into a seperate savings account that will cover one month of other expenses that are not your mortgage or rent. In a seperate savings account find a number that fits comfortably into your budget and start moving that cash into this savings account either every paycheck or once a month. For our family we put aside $25 every paycheck ($50 a month) into savings for Christmas. We hope to bump that up to $40 per paycheck soon! 5.There will always be medical and dental expenses you need to pay and they almost always will be a surprise. So start saving for those medical and dental expenses now to relieve the stress later! Putting $40 away each month into this seperate savings account is a good place to start. 6.Just as sure that you will have unexpected health expenses, your car will most definitely get sick too! Putting $40 a month into a seperate car repair savings account wont cover the major fixes but will be a welcomed aid when the time comes. This is one savings goal our family is planning to incorporate into our financial plan soon! 7.Hubby and I have always been big believers in budgeting in the fun! When we were in the process of paying off our $20,000 debt or saving $22,000 to buy our first house, our “fun” savings goals were always very small. Maybe a $200 budget staycation to celebrate a milestone of some kind. Now that we have checked those goals off our list, we are able to start saving for things like our trip to Costa Rica last year! Depending on your family budget and what priorities you have with financial goals, put away a minimum of $10 a month to have fun! What Savings Accounts Do You Have? Think back to when you were first getting started with your budget, what were the essential savings accounts that you had? Let’s chat in the comments!